DemoCurmudgeon: Trump's ISIS Lie Sarcasm!!? Trump trolls continue to ignore the blatant lies of their orange leader, their chosen candidate for president no matter how much they deny it, because he "tells it like it is." Seriously, you can't turn on conservative talk radio without hearing some mindless caller blather on about Trump's "tell it like is is" honesty. Yet Trump is doing just the opposite, which brings us back to "everyday is opposite day in Republican world." What, the main stream media couldn't tell by the expression on Trump's orange face - like at this recent rally - that he was just kidding? Or this lighthearted back and forth with conservative talker Hugh Hewitt, where Trump not only doubles down on his claim Obama founded ISIS, but he readily admits that making outrageous comments get more news coverage than telling the boring truth. 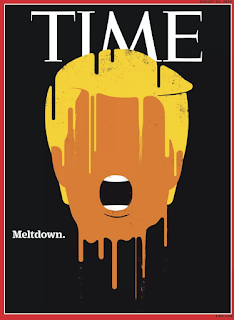 MSNBC's Steve Kornaki pointed out the slip-up, saying "Donald Trump revealed that making outrageous statements that warrant clarification is part of his strategy:"
Hewitt: "You meant Obama created the vacuum, he lost the peace." 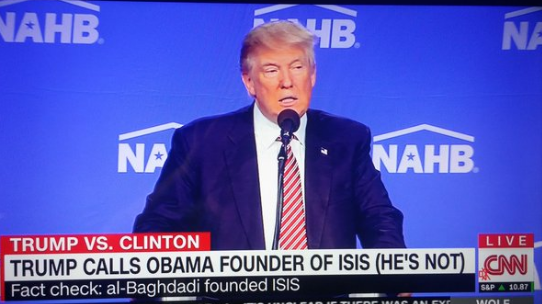 Trump: "No, I mean't he's the founder of ISIS."